Join us for a variety of knitting, crochet, and fiber craft classes and events. We hope you will find the array of classes provides continuous learning opportunities and many connections to other fellow knitters and crocheters. See a class you like? Click on the class date or class title for more information, or select View Calendar >> below for a month view. Please scroll down for class and event registration information and guidelines. It's not cheating! Are you curious about how a knitting machine works, and how it can accelerate your knitting processes? Do you have lots of yarn stash you'd like to knit, but can't hand-knit fast enough? We'll provide a knitting machine demonstration, and will take sign-ups for sessions in May with Leslie to make your own stockinette poncho, worked on the knitting machine. Have you knit or crocheted beautiful scarves, wraps, shawls, and shawlettes, and you're stuck in a rut or unsure how to best style them? Join Yvonne and learn several options for styling your beautiful hand-made shawls, including use with pins. Yvonne will demonstrate with some of her samples, and you may also bring one or two of your own if you'd like styling suggestions. What if you substitute a cotton yarn for a wool yarn recommended in your pattern? What if you want to use a DK weight rather than a worsted weight? 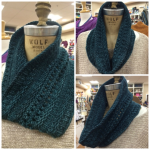 Marissa will share some key considerations when you want to substitute yarn in a pattern. 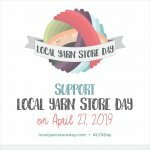 We respectfully request that you purchase your project yarn at our shop, and you will receive a one-time discount on your class yarn purchase, if applicable. Classes and events will begin on time and we encourage you to arrive a few minutes early to get settled. Please come prepared with your recommended supplies. Our current class offerings are geared toward adults at this time however we offer individual and parent/child lessons for our younger knitters (ages 8-13). Check below for dates and times. If you don’t see a class that fits your needs, we are also happy to schedule individual sessions to help you with a specific project or to help you learn a new technique. Please call the shop at 925-263-2661 or send us an email at info at ayarnlessraveled dot com to schedule a convenient time with one of our skilled staff members. Class and event spaces are limited. Your payment will reserve your seat, so register as soon as possible. You may register online, in the shop, or by phone (925-263-2661) using your credit card. Web orders/registration placed after hours and on Mondays will be processed on our next business day. Cancellation prior to 3 days before the workshop will receive store credit. Cancellations within 3 days of the workshop are non-refundable. A Yarn Less Raveled reserves the right to cancel a class or event, and your fee will be refunded to your original payment method. Fees for special guest workshops may be non-refundable. It will be noted in the class description. Let's continue to expand your beginning knitting skills! You will knit the A Yarn Less Raveled Autumn Cowl, and along the way, you will learn to knit in the round using circular needles, and so much more. Explore the joy of sock knitting, as you learn to knit socks from the cuff down, using the Magic Loop method. If you can knit in the round, you can knit a cozy sock! Hand-knitted socks are small, portable projects, as well as practical, comfortable finished accessories, and the yarn options are such fun! Learn to knit in a fun and supportive environment! We'll start with the basics as we create swatches, preparing you to knit your first scarf or cowl. Click on the class title for more information. Let's Get in the Loop! Magic Loop is a technique for working in the round using one long circular needle. This is a handy technique to know so you can knit projects with very small circumferences. Learn the basics of knitting with beads in this fun, technique-based class. You'll learn some basic information about beads and learn how to bring yarn and beads together for your projects. You'll learn tips on how to get started, and you'll practice the beading techniques in class. You'll leave class with a working knowledge of how to add beads to a project, and you'll be hooked.